Hot off the press release today! “Alex Pardee created Bunnywith almost two decades ago and since then, Bunnywith has been fortunate enough to be with thousands of things, going on countless of adventures. 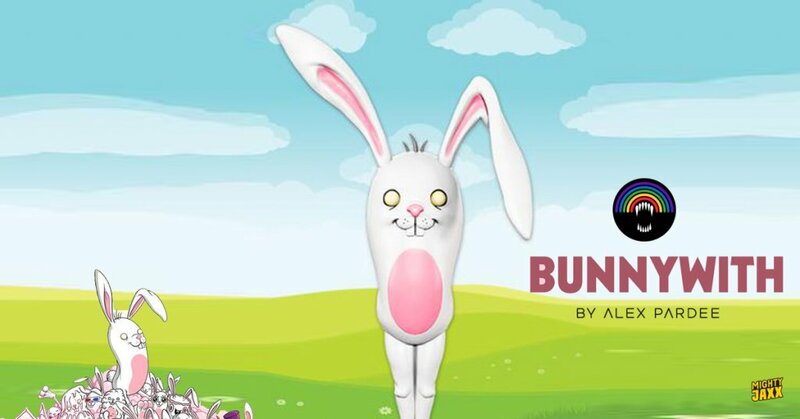 From comic books to mobile phone games, Bunnywith has spread his infectious smile to fans of all ages with his innocent reluctance to be WITH everything he can possibly find. Now that Bunnywith has found a new breath of life in the form of a collectable vinyl figure, this also means that YOU can finally be WITH him every day. Bunnywith is a simple creature with a simple life and that simplicity is what makes him one of the most magical critters in the universe. You see, Bunnywith’s only goal in life is to be WITH things. “What sort of things?” you might ask. Well, ANY thing actually! Big things, small things, soft things, sharp things, invisible things, living things, dead things, delicious things, gross things, dangerous things, adorable things… The list just goes on and on! Bunnywith is always happy as long as he’s WITH something. It’s really that simple so don’t overthink it and give him a reason to smile! Go ahead, give him a moustache and watch him become “Bunnywith Mustache”! Or hand him a silly wizard hat and he becomes “Bunnywith Mystical Powers”! Put a pet wolverine next to him and he’ll be “Bunnywith Adorable Sidekick”! Or make him kiss a dirty toad and he is now “Bunnywith Warts”! The possibilities are indeed endless. Bunnywith stands at 8” tall. WHEN: Bunnywith by Alex Pardee will be made available on the Mighty Jaxx Webstore https://mightyjaxx.rocks for 24 hours starting at 10:00AM EST on Saturday, December 9th and ending at 09:59AM EST on Sunday, December 10th. The edition will be limited by the numbers sold during the 24 hours. Each figure will be individually hand-numbered with the final edition size. While we have your attention, Alex has released his Bunnywith book at https://shop.alexpardee.com/ Priced at only $15. If you are familiar with Bunnywith, you know what you are getting. If you aren’t, it works like this: You take a bunny….and add a “thing”….mix them up….and you get a “BunnyWith A Thing!” Do that 100 times and you have a book! Find Alex at http://www.alexpardee.com/ Facebook , Twitter and Instagram.